Visiting Physician treats minor ailments to serious, chronic illnesses. Below is a list of the more commonly treated conditions. Please note that we are not an emergency/same day service. However, our clinicians are on call 24 hours, seven days a week to answer questions and concerns. If certain symptoms indicate a more serious condition of an urgent nature, we will advise the patient to go to the nearest emergency room. Arteriosclerosis or "hardening of the arteries" occurs when the inside walls of an artery become thicker and less elastic. The thickening reduces the area available for blood flow. Although arteriosclerosis reveals few symptoms at first, the damaged artery eventually cannot carry enough blood to supply the necessary amount of oxygen. Cholesterol and similar substances attach themselves to the inside linings of the arteries. There they gradually thicken into a substance called plaque. As plaque grows, it narrows the artery and in some cases blocks it entirely. This can lead to angina and heart attacks. Hypertension, or high blood pressure, usually has no symptoms, and is often called the "silent killer." High blood pressure occurs when the body's smaller blood vessels narrow, which causes the blood to exert excessive pressure against the vessel walls. Two numbers are used to describe blood pressure: systolic and diastolic. Systolic pressure refers to the pressure the blood exerts on the artery walls as the heart pumps blood, and diastolic refers to the force as the heart relaxes to allow the blood to flow back to the heart. Congestive heart failure, commonly referred to as CHF, occurs when the heart cannot pump out enough blood to meet the needs of the body. All forms of heart disease may eventually lead to CHF. CHF is the most common cause of death for people over the age of 65. Since 85% of our patients are over the age of 75, we have extensive experience in the detection and treatment of all forms of heart disease. We can arrange for on-site mobile x-rays, EKGs and echocardiograms that allow us to monitor the performance of the heart. With the use of proper medications and ongoing care by a medical professional, Visiting Physician is able to help many patients with heart ailments. There are 20.8 million people in the United States, or 7% of the population, who have diabetes. While an estimated 14.6 million have been diagnosed with diabetes, unfortunately, 6.2 million people (or nearly one-third) are unaware that they have the disease. In order to determine whether or not a patient has pre-diabetes or diabetes, health care providers conduct a Fasting Plasma Glucose Test (FPG) or an Oral Glucose Tolerance Test (OGTT). The American Diabetes Association recommends the FPG because it is easier, faster, and less expensive to perform. People with diabetes have the same nutritional needs as anyone else. Along with exercise and medications (insulin or oral diabetes pills), nutrition is important for good diabetes control. By eating well-balanced meals in the correct amounts, you can keep your blood glucose level as close to normal (non-diabetes level) as possible. Chronic obstructive pulmonary disease (COPD), is an umbrella term used to describe progressive lung diseases, encompassing emphysema, chronic bronchitis and chronic asthma. In COPD, the airways — tubes that carry air in and out of your lungs — are partly obstructed, making it difficult to breathe. COPD is the 4th leading cause of death in the U.S. and the world. Emphysema and chronic bronchitis are closely related and persons with COPD may have both, which impair lung function, preventing the lungs from doing their job of bringing oxygen to the body and getting rid of carbon dioxide. Smoking is the main cause of COPD, but other environmental and industrial pollutants can also result in COPD in someone who has never smoked. COPD develops slowly, and it may be many years before you notice symptoms like feeling short of breath. Most of the time, COPD is diagnosed in middle-aged or older people. Quitting smoking is the single most important thing you can do to reduce your risk of developing COPD and slow the progress of the disease. Although COPD cannot be cured, your doctor will recommend treatments that help relieve your symptoms and help you breathe easier. Alzheimer's Disease is a degenerative disease of the brain from which there is no recovery. The disease attacks nerve cells in all parts of the cortex of the brain, impairing a person's ability to govern emotions, coordinate their movements, and remember things. Alzheimer's Disease is common in older individuals with over 50% of all 95 year olds reporting some type of impairment. Alzheimer's is now the fourth leading cause of death in adults. 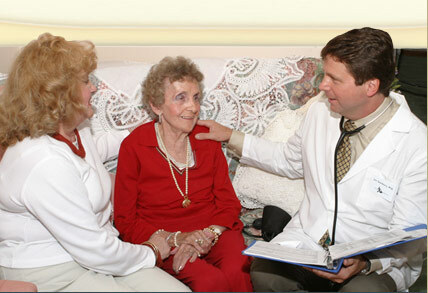 Visiting Physician has extensive experience in treating Alzheimer's Disease. Approximately thirty percent of our patients exhibit some form of Alzheimer's Disease. Fortunately, as more is known about the pathology of the disease, new treatment options will become available, in addition to the symptomatic therapy now offered by a variety of cholinesterase inhibitor drugs. There are currently 10 million Americans suffering from osteoporosis, as well as another 18 million who have low bone mass. Osteoporosis occurs when the body fails to form enough new bone, or when the body reabsorbs too much old bone. Calcium and phosphate are two minerals that are essential for normal bone formation. As people age, calcium and phosphate may be reabsorbed back into the body from the bones, which makes the bone tissue weaker. Women over the age of 60 are the most frequent sufferers of the disease. Conducting a thorough physical examination, performing an urinanalysis, x-rays, and bone density testing can all detect this "silent disease." Parkinson's Disease is a slow progressive disorder that occurs when cells are destroyed in certain parts of the brainstem. This destruction appears to have an impact on the release of dopamine, a major neurotransmitter. A loss in dopamine negatively affects the nerves and muscles controlling movement and coordination. There is probably no single cause for Parkinson's Disease, but rather it is a combination of genetic susceptibility and environmental factors. Urinary incontinence (UI) is a common but poorly understood problem in the elderly population. It is estimated that approximately one in five persons living in a community dwelling has significant urinary incontinence. Although the changes in urinary anatomy that result from normal aging do not cause urinary incontinence, they do create a situation that allows incontinence to occur more easily. Aging does result in a reduced size of the urinary bladder producing a decreased bladder volume and a need for more frequent bladder emptying. Additionally, many diseases and medications can contribute to the problem of urinary incontinence. By reviewing past medical histories, performing a complete physical examination, and conducting blood and urine analyses, Visiting Physicians are able to diagnose and treat the majority of UI cases. For most patients diagnosis and treatment options are inexpensive, non-invasive, and successful.